“Girl from the North Country” (New Musical, The Public Theater): I first learned of the new musical “Girl from the North Country” while standing dejected outside the Noël Coward Theatre in London on a chilly day last winter; I had no idea what the show was about, but the muted, dusty 1930s aesthetic of the production photos instantly caught my eye. Unfortunately, the show was sold out during my visit. Thankfully, the Public Theater is now presenting the American premiere of this original jukebox musical written and directed by Irish playwright Conor McPherson and featuring some 20 songs from the rich catalogue of American folk rocker Bob Dylan (oddly, mostly from the 70s and 80s). Positive reviews aside, I think fear of missing the next “Hamilton” has fueled the multiple extensions and now sold-out run of this musical, which received a tepid audience response on the night I attended and strikes me as rather diffuse, pale, and soulless. Set in a boardinghouse in Duluth, Minnesota over the course of several weeks in November and December of 1934—the depths of the Great Depression—this gentle, sad, and ultimately dirge-like musical follows the comings and goings of a mélange of rootless boarders captured in collage-like, episodic vignettes inappositely interpolated with re-imagined renditions of Dylan’s songs (orchestrated and arranged by Simon Hale). The effect, though visually and aurally appealing (sets and costumes by Rae Smith; lighting by Mark Henderson), lacks intensity and vitality: a veritable pageant of depression. “Girl from the North Country” feels more like a schematic play with music (and a weak one at that), than an integrated musical thanks both to the opaque poetry of Dylan’s lyrics—which provide no sense of character, never propel the plot or extract an emotional meditation, and trade in mystery instead of information—and to the bleak, serious, and overwrought tone of the whole affair. The assembled character types—among them an alcoholic would-be-writer (Colton Ryan), a widow (Jeannette Bayardelle), a Bible salesman (David Pittu), an escaped convict (Sydney James Harcourt), a middle-aged woman with dementia (Mare Winningham), a mentally disabled young man (Todd Almond), a single and pregnant young woman (Kimber Sprawl), a failed businessman (Marc Kudisch), and the boardinghouse owner who is deeply in debt and despair (Stephen Bogardus)—are beat down by their circumstances, falling with no net to catch them in a pre-welfare state of national economic emergency. These are ordinary, forgotten people on the margins; their lives unremarkable, empty, and meaningless. Mr. McPherson does little to give them a compelling voice or story arc. Instead, in the end, the lights fade on the characters, defeated and dead—the beauty of their tragedy lost on me, despite the lovely singing and stagecraft behind the footlights. Rumor has it that Mr. Dylan has blessed a Broadway transfer; I do not see the appeal, but would welcome the opportunity to give it another try. Opened October 1st; runs through December 23rd at The Public Theater’s Newman Theatre. Sold Out. The ensemble of “I Was Most Alive with You”. Photo Credit: Joan Marcus. “I Was Most Alive with You” (New Play, Playwrights Horizons): the notable achievement of Craig Lucas’ new play, “I Was Most Alive with You”, is its ambition to be fully accessible for hearing and deaf and hard-of-hearing audiences alike. 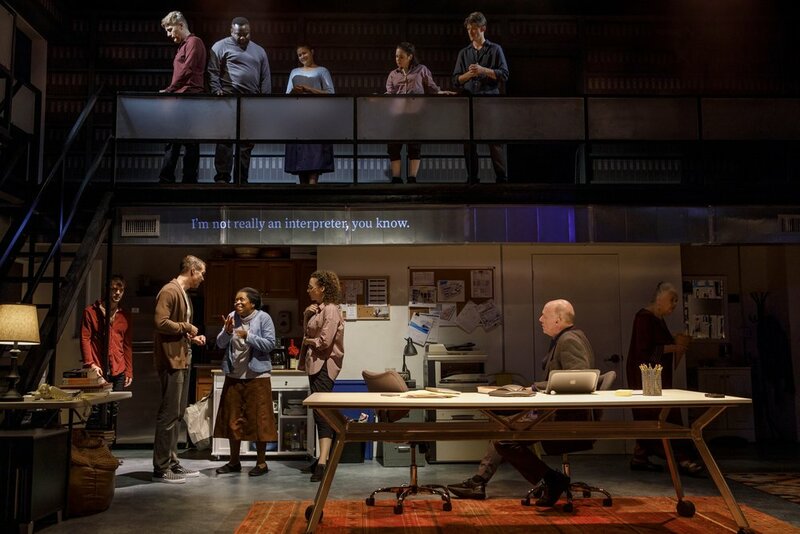 Every member of its ensemble cast is shadowed, on a mezzanine above the stage-level setting, by deaf actor performing the role in American Sign Language. Subtitles are employed when the hearing actors sign, and GalaPro technology allows for the entire play to be subtitled on one’s smart phone in real time. This production marks an important step forward in acknowledging the hearing bias embedded in nearly all live performance by making a play with deaf characters for a deaf audience. As for the play itself, “I Was Most Alive with You” is a seismic drama of Biblical and mythic themes, at once a traditional Thanksgiving dinner play and a re-telling of the Book of Job. Presented as a mostly-imagined reconstruction of events, the play is an archeological dig of family trauma, love, and loss, and a thoughtful examination of the power of the human heart to endure, change, and choose. It opens on a workroom where television writing partners (and maybe more) Ash (Michael Gaston) and Astrid (Marianna Bassham) meet to begin their next project, which fast becomes a dramatic recounting of the prior Thanksgiving and its aftermath in which Ash’s son Knox (Russell Harvard, who is simply ravishing and heartbreaking), a deaf, gay, recovering alcoholic and drug addict, lost his hand in a car accident with his drug-addicted boyfriend Farhad (Tad Cooley); Ash’s mother, Carla (Lois Smith), revealed she was dying from cancer and had lost the family fortune to a Ponzi scheme; and Ash’s distant wife, Pleasant (Lisa Emery), walked out on him and Knox to prevent herself from dying more than she already had. If that feels like a lot, that is the point. Writers have the rare opportunity to create a story that they alone have the power to control; life, on the other hand, is ripe with powerlessness and unpredictability. The characters of “I Was Most Alive with You” grapple with their differences in ability, religion, race, gender, and age on one fateful Thanksgiving, and ultimately demonstrate the many varied facets of coping with life’s misfortunes: from resignation to creation, and possibly destruction. Mr. Lucas purposefully sets out to tackle an abundance of strife in this tautly written drama, but poignant moments throughout fail to amount to a satisfying whole, and too much of his dialogue is unmoored from time or else unrealistically dense with wisdom and therapy, no doubt springing from his own journey through recovery from addiction. Opened September 24th; runs through October 14th at Playwright’s Horizons’ Mainstage Theatre. Discount Tickets.